"Maurya" redirects here. For the 2004 film, see Maurya (film). The maximum extent of the Maurya Empire, as shown in many modern maps. See also this alternative map. The Maurya Empire was a geographically-extensive Iron Age historical power based in Magadha and founded by Chandragupta Maurya which dominated the Indian subcontinent between 322 and 187 BCE. Comprising the majority of South Asia, the Maurya Empire was centralized by the conquest of the Indo-Gangetic Plain, and its capital city was located at Pataliputra (modern Patna). The empire was the largest political entity to have existed in the Indian subcontinent, spanning over 5 million square kilometres (1.9 million square miles) at its zenith under Ashoka. Chandragupta Maurya raised an army, with the assistance of Chanakya (also known as Kauṭilya), and overthrew the Nanda Empire in c. 322 BCE. Chandragupta rapidly expanded his power westwards across central and western India by conquering the satraps left by Alexander the Great, and by 317 BCE the empire had fully occupied northwestern India. The Mauryan Empire then defeated Seleucus I, a diadochus and founder of the Seleucid Empire during the Seleucid–Mauryan war, thus acquiring territory west of the Indus River. At its greatest extent, the empire stretched along the natural boundary of the Himalayas, to the east into Assam, to the west into Balochistan (southwest Pakistan and southeast Iran) and the Hindu Kush mountains of what is now eastern Afghanistan. The dynasty expanded into India's southern regions by the reign of the emperors Chandragupta and Bindusara, but it excluded Kalinga (modern Odisha), until it was conquered by Ashoka. It declined for about 50 years after Ashoka's rule, and dissolved in 185 BCE with the foundation of the Shunga dynasty in Magadha. Under Chandragupta Maurya and his successors, internal and external trade, agriculture, and economic activities all thrived and expanded across South Asia due to the creation of a single and efficient system of finance, administration, and security. The Maurya dynasty built the Grand Trunk Road, one of Asia's oldest and longest trade networks, connecting the Indian subcontinent with Central Asia. After the Kalinga War, the Empire experienced nearly half a century of centralized rule under Ashoka. Chandragupta Maurya's embrace of Jainism increased socio-religious reform across South Asia, while Ashoka's embrace of Buddhism and sponsorship of Buddhist missionaries allowed for the expansion of that faith into Sri Lanka, northwest India, Central Asia, Southeast Asia, Egypt, and Hellenistic Europe. The population of the empire has been estimated to be about 50–60 million, making the Mauryan Empire one of the most populous empires of antiquity. Archaeologically, the period of Mauryan rule in South Asia falls into the era of Northern Black Polished Ware (NBPW). The Arthashastra and the Edicts of Ashoka are the primary sources of written records of Mauryan times. The Lion Capital of Ashoka at Sarnath is the national emblem of the modern Republic of India. The Junagadh rock inscription of Rudradaman (c. 150 CE) prefixes "Maurya" to the names Chandragupta and Ashoka. The Puranas (c. 4th century CE or earlier) use Maurya as a dynastic appellation. The Buddhist texts state that Chandragupta belonged to the "Moriya" clan of the Shakyas, the tribe to which Gautama Buddha belonged. The Jain texts state that Chandragupta was the son of a royal superintendent of peacocks (mayura-poshaka). According to the Buddhist tradition, the ancestors of the Maurya kings had settled in a region where peacocks (mora in Pali) were abundant. Therefore, they came to be known as "Moriyas", literally, "belonging to the place of peacocks". According to another Buddhist account, these ancestors built a city called Moriya-nagara ("Moriya-city"), which was so called, because it was built with the "bricks coloured like peacocks' necks". The dynasty's connection to the peacocks, as mentioned in the Buddhist and Jain traditions, seems to be corroborated by archaeological evidence. For example, peacock figures are found on the Ashoka pillar at Nandangarh and several sculptures on the Great Stupa of Sanchi. Based on this eviedence, modern scholars theorize that the peacock may have been the dynasty's emblem. According to Dhundiraja, a commentator on the Vishnu Purana, the word "Maurya" is derived from Mura, the name of the wife of a Nanda king and the mother (or grandmother) of the first Maurya king. However, the Puranas themselves make no mention of Mura and do not talk of any relation between the Nanda and the Maurya dynasties. Dhundiraja's derivation of the word seems to be his own invention: according to the Sanskrit rules, the derivative of the feminine name Mura (IAST: Murā) would be "Maureya"; the term "Maurya" can only be derived from the masculine "Mura". The Maurya Empire was founded by Chandragupta Maurya, with help from Chanakya, at Takshashila, a noted center of learning. According to several legends, Chanakya travelled to Magadha, a kingdom that was large and militarily powerful and feared by its neighbours, but was insulted by its king Dhana Nanda, of the Nanda dynasty. Chanakya swore revenge and vowed to destroy the Nanda Empire. Meanwhile, the conquering armies of Alexander the Great refused to cross the Beas River and advance further eastward, deterred by the prospect of battling Magadha. Alexander returned to Babylon and re-deployed most of his troops west of the Indus River. Soon after Alexander died in Babylon in 323 BCE, his empire fragmented into independent kingdoms led by his generals. The Greek generals Eudemus and Peithon ruled in the Indus Valley until around 317 BCE, when Chandragupta Maurya (with the help of Chanakya, who was now his advisor) orchestrated a rebellion to drive out the Greek governors, and subsequently brought the Indus Valley under the control of his new seat of power in Magadha. Chandragupta Maurya's rise to power is shrouded in mystery and controversy. On one hand, a number of ancient Indian accounts, such as the drama Mudrarakshasa (Signet ring of Rakshasa – Rakshasa was the prime minister of Magadha) by Vishakhadatta, describe his royal ancestry and even link him with the Nanda family. A kshatriya clan known as the Maurya's are referred to in the earliest Buddhist texts, Mahaparinibbana Sutta. However, any conclusions are hard to make without further historical evidence. Chandragupta first emerges in Greek accounts as "Sandrokottos". As a young man he is said to have met Alexander. He is also said to have met the Nanda king, angered him, and made a narrow escape. Chanakya's original intentions were to train army under Chandragupta's command. Territory of Magadha and the Maurya Empire between 600 and 180 BCE, including Chandragupta's overthrow of the Nanda Empire (321 BCE) and gains from the Seleucid Empire (303 BCE), the southward expansion (before 273 BCE), and Ashoka's conquest of Kalinga (261 BCE). The same animation, modified in accordance with Kulke and Rothermund (see right). Hermann Kulke and Dietmar Rothermund believe that Ashoka's empire did not include large parts of India, which were controlled by autonomous tribes. Preparing to invade Pataliputra, Maurya came up with a strategy. A battle was announced and the Magadhan army was drawn from the city to a distant battlefield to engage with Maurya's forces. Maurya's general and spies meanwhile bribed the corrupt general of Nanda. He also managed to create an atmosphere of civil war in the kingdom, which culminated in the death of the heir to the throne. Chanakya managed to win over popular sentiment. Ultimately Nanda resigned, handing power to Chandragupta, and went into exile and was never heard of again. Chanakya contacted the prime minister, Rakshasas, and made him understand that his loyalty was to Magadha, not to the Nanda dynasty, insisting that he continue in office. Chanakya also reiterated that choosing to resist would start a war that would severely affect Magadha and destroy the city. Rakshasa accepted Chanakya's reasoning, and Chandragupta Maurya was legitimately installed as the new King of Magadha. Rakshasa became Chandragupta's chief advisor, and Chanakya assumed the position of an elder statesman. Pataliputra, capital of the Mauryas. Ruins of pillared hall at Kumrahar site. The Pataliputra capital, discovered at the Bulandi Bagh site of Pataliputra, 4th-3rd c. BCE. In 305 BCE, Chandragupta led a series of campaigns to retake the satrapies left behind by Alexander the Great when he returned westwards, while Seleucus I Nicator fought to defend these territories. The two rulers concluded a peace treaty in 303 BCE, including a marital alliance. Chandragupta snatched the satrapies of Paropamisade (Kamboja and Gandhara), Arachosia (Kandhahar) and Gedrosia (Balochistan), and Seleucus I Nicator received 500 war elephants that were to have a decisive role in his victory against western Hellenistic kings at the Battle of Ipsus in 301 BCE. Diplomatic relations were established and several Greeks, such as the historian Megasthenes, Deimakos and Dionysius resided at the Mauryan court. Megasthenes in particular was a notable Greek ambassador in the court of Chandragupta Maurya. According to Arrian, ambassador Megasthenes (c.350–c.290 BCE) lived in Arachosia and travelled to Pataliputra. Chandragupta established a strong centralized state with an administration at Pataliputra, which, according to Megasthenes, was "surrounded by a wooden wall pierced by 64 gates and 570 towers". Aelian, although not expressly quoting Megasthenes nor mentionning Pataliputra, described Indian palaces as superior in splendor to Persia's Susa or Ectabana. The architecture of the city seems to have had many similarities with Persian cities of the period. Chandragupta's son Bindusara extended the rule of the Mauryan empire towards southern India. The famous Tamil poet Mamulanar of the Sangam literature described how the Deccan Plateau was invaded by the Maurya army. He also had a Greek ambassador at his court, named Megasthenes. The Indians all live frugally, especially when in camp. They dislike a great undisciplined multitude, and consequently they observe good order. Theft is of very rare occurrence. Megasthenes says that those who were in the camp of Sandrakottos, wherein lay 400,000 men, found that the thefts reported on any one day did not exceed the value of two hundred drachmae, and this among a people who have no written laws, but are ignorant of writing, and must therefore in all the business of life trust to memory. They live, nevertheless, happily enough, being simple in their manners and frugal. They never drink wine except at sacrifices. Their beverage is a liquor composed from rice instead of barley, and their food is principally a rice-pottage. —  Strabo XV. i. 53–56, quoting Megasthenes. Chandragupta renounced his throne and followed Jain teacher Bhadrabahu. He is said to have lived as an ascetic at Shravanabelagola for several years before fasting to death, as per the Jain practice of sallekhana. A silver coin of 1 karshapana of the Maurya empire, period of Bindusara Maurya about 297-272 BC, workshop of Pataliputra. Obv: Symbols with a Sun Rev: Symbol Dimensions: 14 x 11 mm Weight: 3.4 g.
Bindusara was born to Chandragupta, the founder of the Mauryan Empire. This is attested by several sources, including the various Puranas and the Mahavamsa. [full citation needed] He is attested by the Buddhist texts such as Dipavamsa and Mahavamsa ("Bindusaro"); the Jain texts such as Parishishta-Parvan; as well as the Hindu texts such as Vishnu Purana ("Vindusara"). According to the 12th century Jain writer Hemachandra's Parishishta-Parvan, the name of Bindusara's mother was Durdhara. Some Greek sources also mention him by the name "Amitrochates" or its variations. Historian Upinder Singh estimates that Bindusara ascended the throne around 297 BCE. Bindusara, just 22 years old, inherited a large empire that consisted of what is now, Northern, Central and Eastern parts of India along with parts of Afghanistan and Baluchistan. Bindusara extended this empire to the southern part of India, as far as what is now known as Karnataka. He brought sixteen states under the Mauryan Empire and thus conquered almost all of the Indian peninsula (he is said to have conquered the 'land between the two seas' – the peninsular region between the Bay of Bengal and the Arabian Sea). Bindusara didn't conquer the friendly Tamil kingdoms of the Cholas, ruled by King Ilamcetcenni, the Pandyas, and Cheras. Apart from these southern states, Kalinga (modern Odisha) was the only kingdom in India that didn't form the part of Bindusara's empire. It was later conquered by his son Ashoka, who served as the viceroy of Ujjaini during his father's reign, which highlights the importance of the town. Bindusara's life has not been documented as well as that of his father Chandragupta or of his son Ashoka. Chanakya continued to serve as prime minister during his reign. According to the medieval Tibetan scholar Taranatha who visited India, Chanakya helped Bindusara "to destroy the nobles and kings of the sixteen kingdoms and thus to become absolute master of the territory between the eastern and western oceans." During his rule, the citizens of Taxila revolted twice. The reason for the first revolt was the maladministration of Susima, his eldest son. The reason for the second revolt is unknown, but Bindusara could not suppress it in his lifetime. It was crushed by Ashoka after Bindusara's death. Bindusara maintained friendly diplomatic relations with the Hellenic World. Deimachus was the ambassador of Seleucid emperor Antiochus I at Bindusara's court. Diodorus states that the king of Palibothra (Pataliputra, the Mauryan capital) welcomed a Greek author, Iambulus. This king is usually identified as Bindusara. Pliny states that the Egyptian king Philadelphus sent an envoy named Dionysius to India. According to Sailendra Nath Sen, this appears to have happened during Bindusara's reign. Unlike his father Chandragupta (who at a later stage converted to Jainism), Bindusara believed in the Ajivika sect. Bindusara's guru Pingalavatsa (Janasana) was a Brahmin of the Ajivika sect. Bindusara's wife, Queen Subhadrangi (Queen Aggamahesi) was a Brahmin also of the Ajivika sect from Champa (present Bhagalpur district). Bindusara is credited with giving several grants to Brahmin monasteries (Brahmana-bhatto). Historical evidence suggests that Bindusara died in the 270s BCE. According to Upinder Singh, Bindusara died around 273 BCE. Alain Dani��lou believes that he died around 274 BCE. Sailendra Nath Sen believes that he died around 273-272 BCE, and that his death was followed by a four-year struggle of succession, after which his son Ashoka became the emperor in 269-268 BCE. According to the Mahavamsa, Bindusara reigned for 28 years. The Vayu Purana, which names Chandragupta's successor as "Bhadrasara", states that he ruled for 25 years. Aśoka pillar at Sarnath. ca. 250 BCE. Fragment of the 6th Pillar Edict of Ashoka (238 BCE), in Brahmi, sandstone, British Museum. The Edicts of Ashoka, set in stone, are found throughout the Subcontinent. Ranging from as far west as Afghanistan and as far south as Andhra (Nellore District), Ashoka's edicts state his policies and accomplishments. Although predominantly written in Prakrit, two of them were written in Greek, and one in both Greek and Aramaic. Ashoka's edicts refer to the Greeks, Kambojas, and Gandharas as peoples forming a frontier region of his empire. They also attest to Ashoka's having sent envoys to the Greek rulers in the West as far as the Mediterranean. The edicts precisely name each of the rulers of the Hellenic world at the time such as Amtiyoko (Antiochus), Tulamaya (Ptolemy), Amtikini (Antigonos), Maka (Magas) and Alikasudaro (Alexander) as recipients of Ashoka's proselytism.Template:Cite book needed The Edicts also accurately locate their territory "600 yojanas away" (a yojanas being about 7 miles), corresponding to the distance between the center of India and Greece (roughly 4,000 miles). Ashoka was followed for 50 years by a succession of weaker kings. Brihadratha, the last ruler of the Mauryan dynasty, held territories that had shrunk considerably from the time of emperor Ashoka. Brihadratha was assassinated in 185 BCE during a military parade by the Brahmin general Pushyamitra Shunga, commander-in-chief of his guard, who then took over the throne and established the Shunga dynasty. Buddhist records such as the Ashokavadana write that the assassination of Brihadratha and the rise of the Shunga empire led to a wave of religious persecution for Buddhists, and a resurgence of Hinduism. According to Sir John Marshall, Pushyamitra may have been the main author of the persecutions, although later Shunga kings seem to have been more supportive of Buddhism. Other historians, such as Etienne Lamotte and Romila Thapar, among others, have argued that archaeological evidence in favour of the allegations of persecution of Buddhists are lacking, and that the extent and magnitude of the atrocities have been exaggerated. Maurya statuette, 2nd century BCE. Hoard of mostly Mauryan coins. Mauryan Empire, Emperor Salisuka or later. Circa 207-194 BCE. Chandragupta Maurya embraced Jainism after retiring, when he renounced his throne and material possessions to join a wandering group of Jain monks. Chandragupta was a disciple of the Jain monk Acharya Bhadrabahu. It is said that in his last days, he observed the rigorous but self-purifying Jain ritual of santhara (fast unto death), at Shravana Belgola in Karnataka. Samprati, the grandson of Ashoka, also patronized Jainism. Samprati was influenced by the teachings of Jain monks like Suhastin and he is said to have built 125,000 derasars across India. Some of them are still found in the towns of Ahmedabad, Viramgam, Ujjain, and Palitana. It is also said that just like Ashoka, Samprati sent messengers and preachers to Greece, Persia and the Middle East for the spread of Jainism, but, to date, no research has been done in this area. Thus, Jainism became a vital force under the Mauryan Rule. Chandragupta and Samprati are credited for the spread of Jainism in South India. Hundreds of thousands of temples and stupas are said to have been erected during their reigns. The stupa, which contained the relics of Buddha, at the center of the Sanchi complex was originally built by the Maurya Empire, but the balustrade around it is Sunga, and the decorative gateways are from the later Satavahana period. The Dharmarajika stupa in Taxila, modern Pakistan, is also thought to have been established by Emperor Asoka. Magadha, the centre of the empire, was also the birthplace of Buddhism. Ashoka initially practised Hinduism but later embraced Buddhism; following the Kalinga War, he renounced expansionism and aggression, and the harsher injunctions of the Arthashastra on the use of force, intensive policing, and ruthless measures for tax collection and against rebels. Ashoka sent a mission led by his son Mahinda and daughter Sanghamitta to Sri Lanka, whose king Tissa was so charmed with Buddhist ideals that he adopted them himself and made Buddhism the state religion. Ashoka sent many Buddhist missions to West Asia, Greece and South East Asia, and commissioned the construction of monasteries and schools, as well as the publication of Buddhist literature across the empire. He is believed to have built as many as 84,000 stupas across India, such as Sanchi and Mahabodhi Temple, and he increased the popularity of Buddhism in Afghanistan, Thailand and North Asia including Siberia. Ashoka helped convene the Third Buddhist Council of India's and South Asia's Buddhist orders near his capital, a council that undertook much work of reform and expansion of the Buddhist religion. Indian merchants embraced Buddhism and played a large role in spreading the religion across the Mauryan Empire. Mauryan architecture in the Barabar Caves. Lomas Rishi Cave. 3rd century BCE. The peacock was a dynastic symbol of Mauryans, as depicted by Ashoka's pillars at Nandangarh and Sanchi Stupa. Approximate reconstitution of the Great Stupa at Sanchi under the Mauryas. Remains of the Ashokan Pillar in polished stone (right of the Southern Gateway). Remains of the shaft of the pillar of Ashoka, under a shed near the Southern Gateway. Pillar and its inscription (the "Schism Edict") upon discovery. The two Yakshas, possibly 3rd century BCE, found in Pataliputra. The protection of animals in India became serious business by the time of the Maurya dynasty; being the first empire to provide a unified political entity in India, the attitude of the Mauryas towards forests, their denizens, and fauna in general is of interest. The Mauryas firstly looked at forests as resources. For them, the most important forest product was the elephant. Military might in those times depended not only upon horses and men but also battle-elephants; these played a role in the defeat of Seleucus, one of Alexander's former generals. The Mauryas sought to preserve supplies of elephants since it was cheaper and took less time to catch, tame and train wild elephants than to raise them. Kautilya's Arthashastra contains not only maxims on ancient statecraft, but also unambiguously specifies the responsibilities of officials such as the Protector of the Elephant Forests. On the border of the forest, he should establish a forest for elephants guarded by foresters. The Office of the Chief Elephant Forester should with the help of guards protect the elephants in any terrain. The slaying of an elephant is punishable by death. The Mauryas valued certain forest tracts in strategic or economic terms and instituted curbs and control measures over them. They regarded all forest tribes with distrust and controlled them with bribery and political subjugation. They employed some of them, the food-gatherers or aranyaca to guard borders and trap animals. The sometimes tense and conflict-ridden relationship nevertheless enabled the Mauryas to guard their vast empire. Our king killed very few animals. However, the edicts of Ashoka reflect more the desire of rulers than actual events; the mention of a 100 'panas' (coins) fine for poaching deer in royal hunting preserves shows that rule-breakers did exist. The legal restrictions conflicted with the practices freely exercised by the common people in hunting, felling, fishing and setting fires in forests. A map showing the north western border of Maurya Empire, including its various neighboring states. Mainstream scholarship asserts that Chandragupta received vast territory west of the Indus, including the Hindu Kush, modern-day Afghanistan, and the Balochistan province of Pakistan. Archaeologically, concrete indications of Mauryan rule, such as the inscriptions of the Edicts of Ashoka, are known as far as Kandahar in southern Afghanistan. The treaty on "Epigamia" implies lawful marriage between Greeks and Indians was recognized at the State level, although it is unclear whether it occurred among dynastic rulers or common people, or both.Template:Cite book needed. An Edict of Ashoka in Shahbazbarhi, KPK, Pakistan. 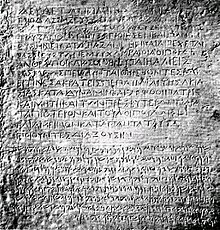 The Kandahar Edict of Ashoka, a bilingual edict (Greek and Aramaic) by king Ashoka, from Kandahar. Kabul Museum. (Click image for translation). The distribution of the Edicts of Ashoka. Map of the Buddhist missions during the reign of Ashoka. The Greeks in India even seem to have played an active role in the propagation of Buddhism, as some of the emissaries of Ashoka, such as Dharmaraksita, are described in Pali sources as leading Greek ("Yona") Buddhist monks, active in Buddhist proselytism (the Mahavamsa, XII[non-primary source needed]). 322 BCE: Chandragupta Maurya founded the Mauryan Empire by overthrowing the Nanda Dynasty. 317–316 BCE: Chandragupta Maurya conquers the Northwest of the Indian subcontinent. 305–303 BCE: Chandragupta Maurya gains territory from the Seleucid Empire. 298–269 BCE: Reign of Bindusara, Chandragupta's son. He conquers parts of Deccan, southern India. 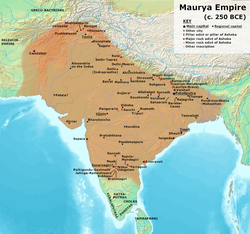 269–232 BCE: The Mauryan Empire reaches its height under Ashoka, Chandragupta's grandson. 261 BCE: Ashoka conquers the kingdom of Kalinga. 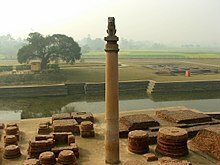 250 BCE: Ashoka builds Buddhist stupas and erects pillars bearing inscriptions. 184 BCE: The empire collapses when Brihadnatha, the last emperor, is killed by Pushyamitra Shunga, a Mauryan general and the founder of the Shunga Empire. According to Vicarasreni of Merutunga, Mauryans rose to power in 312 BC. ^ Niharranjan Ray; Brajadulal Chattopadhyaya (2000). A Sourcebook of Indian Civilization. Orient Blackswan. p. 553. ISBN 978-81-250-1871-1. Aśoka is known to have designated his realm as Jambudvīpa. [...] Two terms, Jambudvīpa and Pṛthvī now appear to have stood for the [...] Maurya realm. ^ a b Hermann Kulke 2004, p. 69-70. ^ Turchin, Peter; Adams, Jonathan M.; Hall, Thomas D (December 2006). "East-West Orientation of Historical Empires". Journal of world-systems research. 12 (2): 223. ISSN 1076-156X. Archived from the original on 17 September 2016. Retrieved 16 September 2016. ^ Thanjan, Davis K. (2011). Pebbles. Bookstand Publishing. ISBN 9781589098176. ^ Hermann Kulke 2004, pp. xii, 448. ^ Thapar, Romila (1990). A History of India, Volume 1. Penguin Books. p. 384. ISBN 0-14-013835-8. ^ Keay, John (2000). India: A History. Grove Press. p. 82. ISBN 978-0-8021-3797-5. ^ a b R. K. Mookerji 1966, p. 31. ^ Seleucus I ceded the territories of Arachosia (modern Kandahar), Gedrosia (modern Balochistan), and Paropamisadae (or Gandhara). Aria (modern Herat) "has been wrongly included in the list of ceded satrapies by some scholars [...] on the basis of wrong assessments of the passage of Strabo [...] and a statement by Pliny." (Raychaudhuri & Mukherjee 1996, p. 594). ^ John D Grainger 2014, p. 109:Seleucus "must [...] have held Aria", and furthermore, his "son Antiochos was active there fifteen years later." ^ The account of Strabo indicates that the western-most territory of the empire extended from the southeastern Hindu Kush, through the region of Kandahar, to coastal Balochistan to the south of that (Raychaudhuri & Mukherjee 1996, p. 594). ^ Sri Lanka and the southernmost parts of India (modern Tamil Nadu and Kerala) remained independent, despite the diplomacy and cultural influence of their larger neighbor to the north (Schwartzberg 1992, p. 18; Kulke & Rothermund 2004, p. 68). ^ Bhandari, Shirin (2016-01-05). "Dinner on the Grand Trunk Road". Roads & Kingdoms. Retrieved 2016-07-19. ^ Hermann Kulke 2004, p. 67. ^ Boesche, Roger (2003-03-01). The First Great Political Realist: Kautilya and His Arthashastra. p. 11. ISBN 9780739106075. ^ Demeny, Paul George; McNicoll, Geoffrey (May 2003). Encyclopedia of population. ISBN 9780028656793. ^ a b c d e Irfan Habib & Vivekanand Jha 2004, p. 14. ^ R. K. Mookerji 1966, p. 14. ^ a b R. K. Mookerji 1966, p. 15. ^ H. C. Raychaudhuri 1988, p. 140. ^ R. K. Mookerji 1966, p. 8. ^ Sugandhi, Namita Sanjay (2008). Between the Patterns of History: Rethinking Mauryan Imperial Interaction in the Southern Deccan. pp. 88–89. ISBN 9780549744412. ^ Paul J. Kosmin 2014, p. 31. ^ Mookerji, Radhakumud (1966). Chandragupta Maurya and His Times. Motilal Banarsidass. p. 27. ISBN 9788120804050. ; Mookerji, Radha Kumud (1957). "The Foundation of the Mauryan Empire". In K. A. Nilakanta Sastri. A Comprehensive History of India, Volume 2: Mauryas and Satavahanas. Orient Longmans. p. 4. : "The Mudrarakshasa further informs us that his Himalayan alliance gave Chandragupta a composite army ... Among these are mentioned the following : Sakas, Yavanas (probably Greeks), Kiratas, Kambojas, Parasikas and Bahlikas." ^ Shashi, Shyam Singh (1999). Encyclopaedia Indica: Mauryas. Anmol Publications. p. 134. ISBN 9788170418597. : "Among those who helped Chandragupta in his struggle against the Nandas, were the Sakas (Scythians), Yavanas (Greeks), and Parasikas (Persians)"
^ Paul J. Kosmin 2014, p. 38. ^ "Megasthenes lived with Sibyrtius, satrap of Arachosia, and often speaks of his visiting Sandracottus, the king of the Indians." Arrian, Anabasis Alexandri Arrian. "Book 5". Anabasis. ^ a b c Upinder Singh 2008, p. 331. ^ Paul J. Kosmin 2014, p. 32. ^ R. K. Mookerji 1966, pp. 39–40. ^ a b Geoffrey Samuel 2010, pp. 60. ^ a b Romila Thapar 2004, p. 178. ^ R. K. Mookerji 1966, pp. 39–41. ^ Srinivasachariar 1974, p. lxxxvii. ^ Vincent Arthur Smith (1920). Asoka, the Buddhist emperor of India. Oxford: Clarendon Press. pp. 18–19. ISBN 9788120613034. ^ Rajendralal Mitra (1878). "On the Early Life of Asoka". Proceedings of the Asiatic Society of Bengal. Asiatic Society of Bengal: 10. ^ Motilal Banarsidass (1993). "The Minister Cāṇakya, from the Pariśiṣtaparvan of Hemacandra". In Phyllis Granoff. The Clever Adulteress and Other Stories: A Treasury of Jaina Literature. Translated by Rosalind Lefeber. pp. 204–206. ^ a b c Paul J. Kosmin 2014, p. 35. ^ Alain Daniélou 2003, p. 108. ^ Dineschandra Sircar 1971, p. 167. ^ William Woodthorpe Tarn (2010). The Greeks in Bactria and India. Cambridge University Press. p. 152. ISBN 9781108009416. ^ Mookerji Radhakumud (1962). Asoka. Motilal Banarsidass. p. 8. ISBN 978-81-208-0582-8. Archived from the original on 10 May 2018. ^ a b Alain Daniélou 2003, p. 109. ^ Eugène Burnouf (1911). Legends of Indian Buddhism. New York: E. P. Dutton. p. 59. ^ a b c d S. N. Sen 1999, p. 142. ^ Kashi Nath Upadhyaya (1997). Early Buddhism and the Bhagavadgita. Motilal Banarsidass. p. 33. ISBN 9788120808805. ^ Fitzedward Hall, ed. (1868). The Vishnu Purana. IV. Translated by H. H. Wilson. Trübner & Co. p. 188. ^ Allchin, F.R. ; Erdosy, George (1995). The Archaeology of Early Historic South Asia: The Emergence of Cities and States. Cambridge: Cambridge University Press. p. 306. ^ Edicts of Ashoka, 13th Rock Edict, translation S. Dhammika. ^ Gabriel A, Richard (30 November 2006). The Ancient World :Volume 1 of Soldiers' lives through history. Greenwood Publishing Group. p. 28. ^ R. C. Majumdar 2003, p. 107. ^ The Economic History of the Corporate Form in Ancient India. Archived 4 February 2016 at the Wayback Machine University of Michigan. ^ R. K. Mookerji 1966, pp. 39-41. ^ Hermann Kulke 2004, pp. 64-65. ^ John Cort 2010, p. 142. ^ John Cort 2010, p. 199. ^ Tukol, T. K. Jainism in South India. Archived from the original on 4 March 2016. 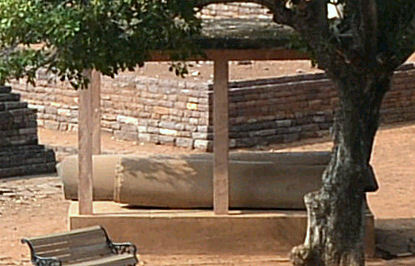 ^ Described in Marshall p.25-28 Ashoka pillar. ^ Allen, Charles (2012). Ashoka: The Search for India's Lost Emperor. London: Hachette Digital. p. 274. ISBN 978-1-408-70388-5. ^ Rangarajan, M. (2001) India's Wildlife History, pp 7. ^ a b c Rangarajan, M. (2001) India's Wildlife History, pp 8. ^ a b Mookerji, Radhakumud (1966). Chandragupta Maurya and His Times. Motilal Banarsidass. pp. 16–17. ISBN 9788120804050. ^ "Plutarch, Alexander, chapter 1, section 1". ^ "Appian, The Syrian Wars 11". Archived from the original on 3 November 2007. ^ R. C. Majumdar 2003, p. 105. ^ W. W. Tarn (1940). "Two Notes on Seleucid History: 1. Seleucus' 500 Elephants, 2. Tarmita", The Journal of Hellenic Studies 60, p. 84-94. ^ Paul J. Kosmin 2014, p. 37. ^ "Pliny the Elder, The Natural History (eds. John Bostock, M.D., F.R.S., H.T. Riley, Esq., B.A.)". Archived from the original on 28 July 2013. ^ Vincent A. Smith (1998). Ashoka. Asian Educational Services. ISBN 81-206-1303-1. ^ Walter Eugene Clark (1919). "The Importance of Hellenism from the Point of View of Indic-Philology", Classical Philology 14 (4), p. 297-313. ^ "Problem while searching in The Literature Collection". Archived from the original on 13 March 2007. ^ "The Literature Collection: The deipnosophists, or, Banquet of the learned of Athenæus (volume III): Book XIV". Archived from the original on 11 October 2007. ^ Kosmin, Paul J. (2014). The Land of the Elephant Kings. Harvard University Press. p. 57. ISBN��9780674728820. ^ Kailash Chand Jain 1991, p. 85. Alain Daniélou (2003). A Brief History of India. Simon and Schuster. ISBN 978-1-59477-794-3. Arthur Llewellyn Basham (1951). History and doctrines of the Ājīvikas: a vanished Indian religion. foreword by L. D. Barnett (1 ed.). London: Luzac. Burton Stein (1998). A History of India (1st ed. ), Oxford: Wiley-Blackwell. Geoffrey Samuel (2010). The Origins of Yoga and Tantra. Indic Religions to the Thirteenth Century. Cambridge University Press. H. C. Raychaudhuri (1988) . "Indian in the Age of the Nandas". In K. A. Nilakanta Sastri. Age of the Nandas and Mauryas (Second ed.). Delhi: Motilal Banarsidass. ISBN 978-81-208-0466-1. H. C. Raychaudhuri; B. N. Mukherjee (1996). Political History of Ancient India: From the Accession of Parikshit to the Extinction of the Gupta Dynasty. Oxford University Press. Hermann Kulke; Dietmar Rothermund (2004). A History of India (4th ed.). London: Routledge. ISBN 0-415-15481-2. Irfan Habib; Vivekanand Jha (2004). Mauryan India. A People's History of India. Aligarh Historians Society / Tulika Books. ISBN 978-81-85229-92-8. J. E. Schwartzberg (1992). A Historical Atlas of South Asia. University of Oxford Press. John Keay (2000). India, a History. New York: Harper Collins Publishers. John Cort (2010). Framing the Jina: Narratives of Icons and Idols in Jain History. Oxford University Press. ISBN 978-0-19-538502-1. John D Grainger (2014). Seleukos Nikator (Routledge Revivals): Constructing a Hellenistic Kingdom. Taylor & Francis. ISBN 978-1-317-80098-9. Kailash Chand Jain (1991). Lord Mahāvīra and His Times. Motilal Banarsidass. ISBN 978-81-208-0805-8. Paul J. Kosmin (2014). The Land of the Elephant Kings: Space, Territory, and Ideology in Seleucid Empire. Harvard University Press. ISBN 978-0-674-72882-0. R. K. Mookerji (1966). Chandragupta Maurya and His Times. Motilal Banarsidass. ISBN 978-81-208-0405-0. R. C. Majumdar (2003) . Ancient India. Motilal Banarsidass. ISBN 81-208-0436-8. Romila Thapar (2004) [first published by Penguin in 2002]. Early India: From the Origins to A.D. 1300. University of California Press. ISBN 978-0-520-24225-8. S. N. Sen (1999). Ancient Indian History and Civilization. New Age International. ISBN 978-81-224-1198-0. Upinder Singh (2008). A History of Ancient and Early Medieval India: From the Stone Age to the 12th Century. Pearson. ISBN 978-81-317-1677-9. Wikimedia Commons has media related to Mauryan Empire.